This Saturday our A team are heading to the sunny shores of Brighton to bout in what’s expected to be an explosive game. Neither team have met on track before, after narrowly missing out on a match up at the UKRDA tournament earlier this year both teams have been looking forward to battling it out. Central City are fresh from a win against both Paris’ A and B team and are pushing full steam ahead this season with a packed bouting schedule including several WFTDA sanctioned games. Brighton have maintained a high profile on the derby scene over the last 2 years taking some high profile victories and are keen to maintain their place as one of the top twenty teams in Europe. Both teams are excited to be rolling against each other and I caught up with CCR’s Boots Manuva and Brighton’s Racey Slamhard for their thoughts on the upcoming game. 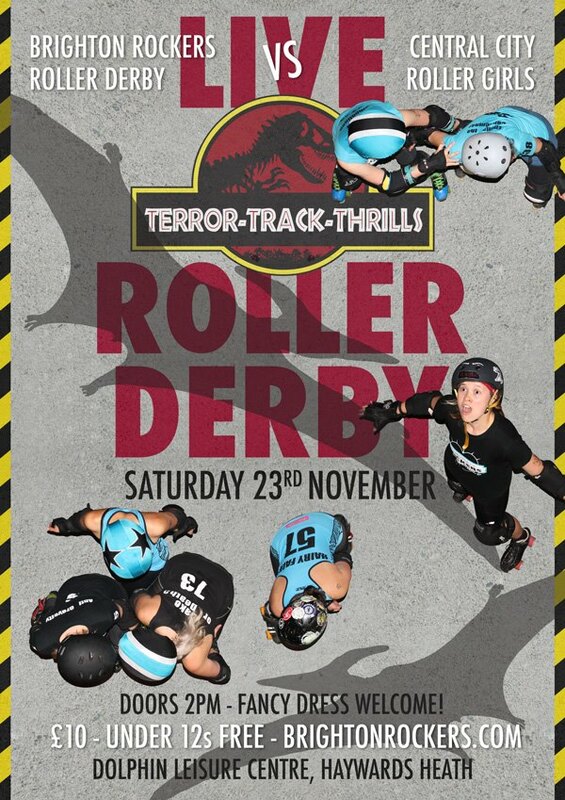 Terror Track Thrills is Jurrassic Park themed, doors open at 2.30, first whistle is at 3pm. After party details TBC Tickets cost £10, under 12s go free, and are available from the website from the 11th October: www.brightonrockers.com.